Time for Peek at My Week hosted by Mrs. Laffin's Laughings. using SMARTBOARD exchange. For each sense I had an activity. For example: smell we passed around a scented candle to guess the smell and then vote if we liked it or not. For sight I put 8 items on a tray of various colors and shapes and we looked at them and then I covered the tray. I also revealed pictures for them to make the sound of what they saw. We made the sound of drums, frogs, baby chicks, a phone, and fire truck. After that, I passed around objects for the kiddos to feel. I passed around dear antlers, a teddy bear, pumpkins, a ball, and a cucumber. We wrote down descriptive words to share. Last, but not least we tried cucumbers from our school garden. We talked about how they tasted. We made a graph to show if we liked it, didn't care for it, or were not sure. I challenged them to think about how they look like their family members and how we could fit into one of the groups we listed before. We made the connection that we are mammals which was really hard for some to grasp. We drew our favorite animals and played a riddle game after listing the 5 vertebrate along with other clues. We then hung up the pictures under our categories to start making connections. We finished by playing the Animal Characteristics Game that we will play each week until our unit is done. 2nd= Students will learn about air through bubble experiments and answer the question, "How do we know air is there." We used the FOSS unit and the scientific process to prove that Air is there, Air is matter, Air takes up space, and Air can be captured. Kids love water. Kids love amazing discoveries. Kids don't always like to write and reflect. We are working on that one. 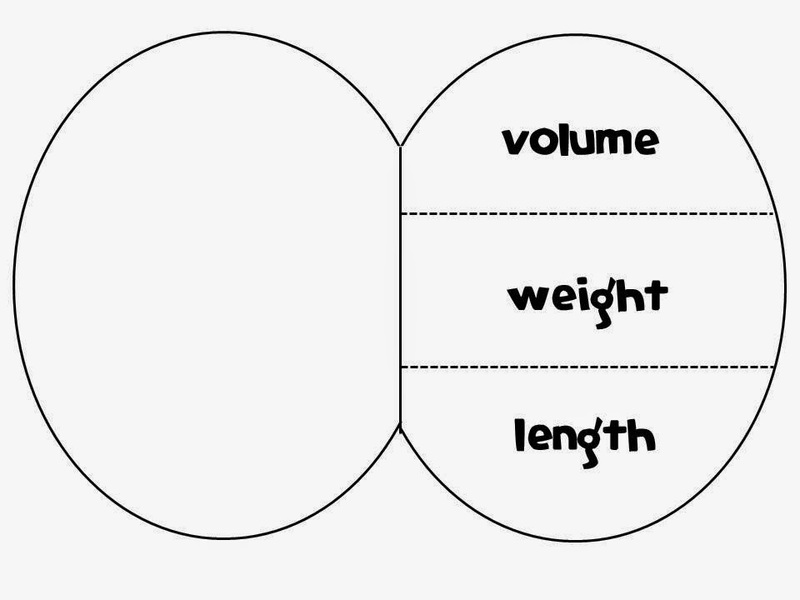 3rd= Students will demonstrate the use of the metric system to measure length, weight, and volume. Students in third grade have not measured too much so far. When I asked them to recall what tool I would use to measure my weight, three out of the four classes replied, "a ruler." I was worried. However, after setting up stations for volume, mass, and length it got a bit better. Here is a freebie for you to use that I made to remind them of tools to use... We used this Measurement Flip Book to help us write down the definitions and tools inside the book. 4th= Students will answer the question, "what objects are attracted to magnets" and determine a pattern. Students will be introduced to new vocabulary that coincides with answering the question. We used the FOSS lesson to help us go through the scientific process. We finished up with our vocabulary reflections in our science notebooks: discoveries, observations, and vocabulary. 5th=Students will learn the difference between dependent, independent, and controlled variables through experimentation and demonstration. I started off by asking them what is a variable. No one knew. I then proceeded to have them follow the directions to make a paper airplane. I continued to use the words variable and control in context as kids struggled with the directions. When we were all finished I once again asked what a variable and control is. They got it. I defined the three types. Then I asked the students how can we change the airplane? We had to remember only change one thing and then test it. We practiced on my model airplane and found we could determine a dependent variable, an independent variable, and the controls. I showed them a power point of pictures of pendulums. I asked what they had in common and to define pendulum. I showed them a bird bobber, swing set, perpetual motion balls, a hypnotist's necklace, and a grandfather clock. I told them they were now in clock repair school because time flies when your having fun in science. My clock was going way to fast and I needed help fixing it. We first had to build a control which was this week. We build our controlled pendulum and then tested it. We all got the same results. Wallah, a control. We wrote in our science notebooks once again to wrap up. Take a look at my littles building...measuring...and sharing! Stay tuned for next's weeks...peek at my week! Such fun! I am seriously jealous of your FOSS program! Have a great week, Renee.